To tell the truth, it can get a little confusing shopping for Manuka honey. Between MGOs, UMFs, NPAs, K-Factors, and number ratings that might read 15+ on one jar and 550 on another, it can be difficult to tell exactly what you’re getting in your honey. If you don’t know what to look for, you could end up with a jar of “antimicrobial honey” you’d be better off spreading over some toast. UMF is the industry standard for Manuka honey and should probably be the first sign you look for. There are a number of legitimate distributors of genuine Manuka honey that use their own rating instead of UMF (this is where your MGOs and K-Factors come in), but UMF is the most widely-accepted standard. “UMF” is an acronym for “Unique Manuka Factor”. Only products licensed and verified by the UMFHA (Unique Manuka Factor Honey Association) as genuine Manuka honey receive the UMF label. 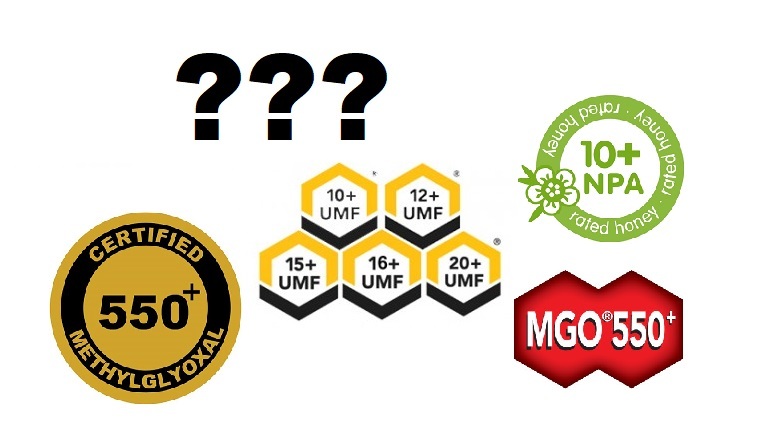 In addition to the seal, the UMFHA gives the honey a rating on their UMF scale to indicate the levels of leptosperin, methylglyoxal (MG), and DHA (the chemical that creates more MGO) in an effort to quantify the non-peroxide activity (NPA) present. That’s an awful lot of acronyms, but the UMF rating aims to boil down all those moving parts into one easy-to-read rating. Most UMF ratings will range from 1 to about 25 on the upper end of the spectrum. The honey rated at 10 or lower is generally used for eating. Anything rated above 15 is considered medical-grade and displays significant antimicrobial activity. You see, not all Manuka is created equal when it comes to fighting off microbes. Only the medical-grade honey rated above 15 on the UMF scale is active enough to fight off bacteria in a wound, as described in our previous post on “Manuka Magic”. For HoneyCure, we make sure to only use UMF-certified honey with a UMF rating of 16+ or higher. With the UMF label we can trust that the honey we use is 100% authentic Manuka honey and the 16+ rating ensures that it will have the unique antimicrobial qualities we need to create an effective wound care product. MGO is the next most commonly recognized rating used when grading Manuka honey. The the number associated with an MGO rating is actually an indication of the amount of methylglyoxal in the honey. That is, whereas UMF is a measurement of all the chemical markers (leptosperin, DHA, and methylglyoxal), the MGO rating pares that down to a simple measurement of the methylglyoxal in the honey. A higher amount of methylglyoxal is generally going to be indicative of the NPA (Non-Peroxide Activity) that makes Manuka honey so desirable. With all this in mind, there are calculators elsewhere on the web that can make it a little easier to compare labels on your prospective purchases. Keep an eye out for the right labels and you can be confident that you're getting that Manuka Magic in your honey.